But massive money printing and cowardly suspension of mark-to-market policies for loans let the banks off the hook. The Economic Winter Season’s primary purpose is to flush out unproductive debt and deleverage financial asset bubbles that are weighing down the economy and stoking income inequality. It forces businesses to cut excessive costs and get more efficient. All of this makes the economy much more productive and ignites a strong recovery, like the one we saw from 1933 to 1937… and for decades to follow. Well… no detox means no strong recovery! Japan is the poster child for a comatose economy three decades after their great crash. Our poor GDP numbers over the last 11 years is evidence closer to home. Still, our debt continues to grow. Government debt leads the way, with corporate debt close on its heels. 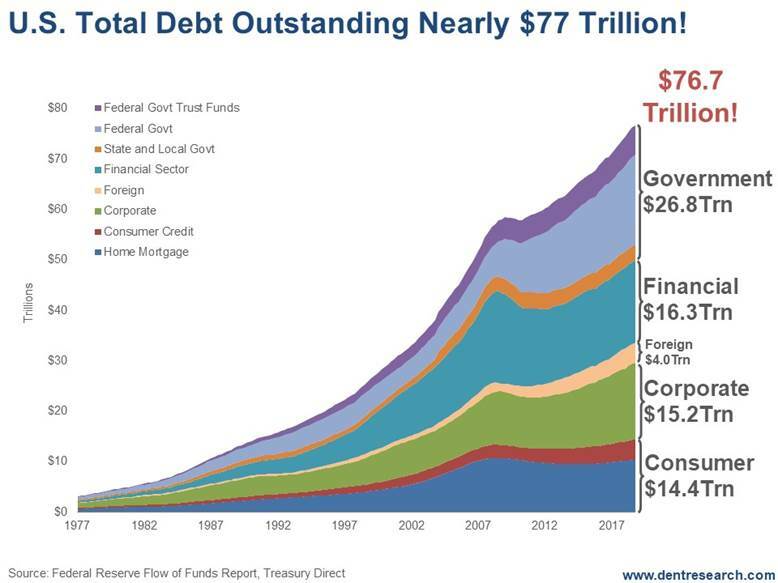 Federal government debt has exploded from $7.8 trillion to $17.9. That’s a 129% increase. The government debt has been doubling about every two administrations or every eight years. Counting the trust funds like Social Security (sitting around) $5.9 trillion, we’re up to $23.8 trillion. Overall government debt, including state and local, is now at $26.8 trillion; up 77%. Foreign debt is up the most: 152%, to $4 trillion… but it is the smallest sector. The other big sector is corporate debt. It has grown from $10.6 trillion to $15.2 trillion. That’s an increase of 44%. And the majority of that debt is BBB rated or lower… just one step above junk. The whole world went on a corporate debt spree. What with low interest rates it was a no-brainer. In the U.S., much of that cheap money went to buying back stock to leverage earnings; a move that will look stupid when companies most need cash to survive the greatest shake-out of our lifetimes during the next several years. Consumer debt is only marginally higher than it was at the 2009 peak, with mortgage debt down 2%. But consumer credit – cards and car loans – are up 53%. And a subprime auto credit crisis is rearing its ugly head, with defaults a major – and growing – concern. 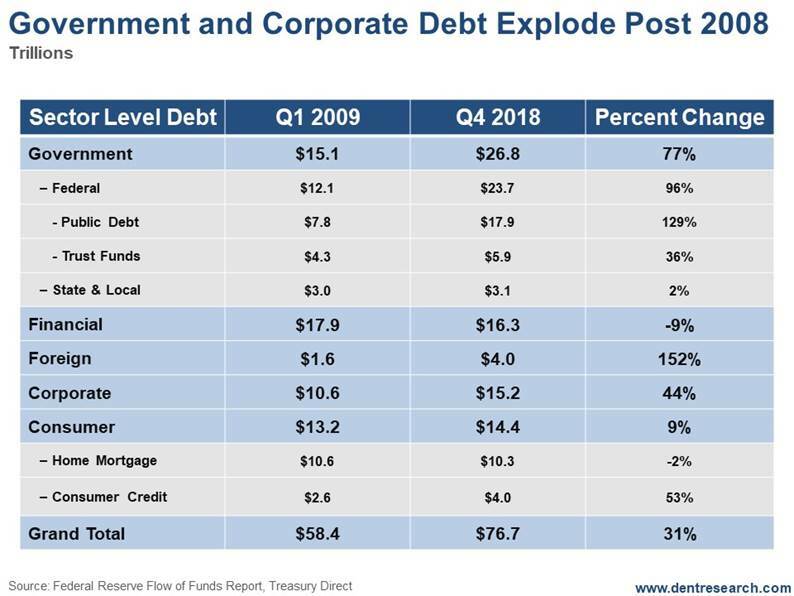 Financial debt is down 9%… but this was the most toxic and out-of-whack sector in the 2008 meltdown. The fact that it’s still this high 11 years later is actually terrifying. The implications are clear and simple: We’ll have to finally see debt deleverage from higher levels in the next crisis, which is clearly due between 2020 and 2023 by my most important cycles. It won’t be pretty. In fact, it’ll look like 1930 to 1933. Only this time, rather than having the crash at the beginning of the Economic Winter Season, like we saw at the start of the Great Depression, we’ll have the crisis at the end. 2008 to 2023 will go down in history as the Economic Winter Season central banks couldn’t stop.